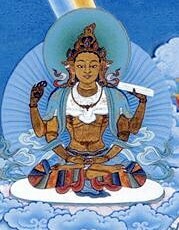 There are twelve commentaries which combine sutras with the Abhisamayalankara, and nine which do not. Among the former group, four use the 25,000 Verses, three use the 8,000 Verse text, three use The Condensed Sutra, one uses the 100,000 Verses, and one uses the three texts of the 100,000 Verses, the 25,000 and the 8,000. Explanation of the 100,000 said to be by Kashmiri Dharmashri. Teaching on the Three Renowned ‘Mother’ Scriptures in Conformity with the Eight Points said to be by Lord Smritijñanakirti. Among these, The Explanatory Commentary Clarifying the Words, Light on the Difficult-to-Comprehend, and Prajñakaramati’s Essential Meaning are commentaries on [Haribhadra’s] Clear Meaning Commentary. It is explained in Drukpa Pema Karpo’s commentary on the prajñaparamita that Haribhadra and Prajñakaramati both saw Maitreya directly, and that Dharmamitra saw him in a dream. Some assert that The Ascertainment of Suchness written by Noble Asanga is a commentary that combines sutra and Abhisamayalankara, and some even say that the Clear Meaning Commentary is a commentary combining sutra and Abhisamayalankara. This would mean that the number of commentaries combining sutras and Abhisamayalankara could not be fixed definitively at twelve, but since this would contradict what is generally accepted, it requires investigation. Scholars may take as an issue for further investigation the question of whether Kashmiri Buddhashri’s 100,000 Verse Commentary, Smritijñanakirti’s work on the Three Mother Scriptures in Comformity with the Eight Points, and Atisha’s Lamp of Essential Meaning are to be classified as the works of Indian Panditas or Tibetan Scholars. Was elucidated by the Dharma Lord Ajita in Tushita. But those commentaries of Arya [Vimuktisena] and Haribhadra are especially sublime. Just as he says, one should rely mainly upon the commentaries of Vimuktisena and Haribhadra. This page was last edited on 27 February 2018, at 06:04.